As Christmas approaches, it's time to tackle those card-making projects you have floating around in your head. To get you started, here is a quick and easy card you can make for someone special this Christmas. To create this card you will need Aspen Green Bazzil cardstock or ready made card, Creative Imaginations Red Squiggle paper, Sonnets Green Wash paper and Suzy's Zoo Christmas Mouse with Candle Stickers. Begin by making your card. I used a ready-made Bazzil card, but you can also cut your own from Aspen Bazzil cardstock. 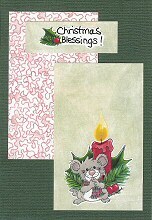 Next, cut a rectangle about 6cm by 10cm from red squiggle paper and adhere in the top left-hand corner of your card. Cut a rectangle the same size from your green wash paper and adhere to the bottom right corner. You will also need to cut a small strip for your title. Position it towards the top of your card and adhere. Decorate with your stickers and you're all done in less than 10 minutes!